A Borderline Mom: The things they don't tell you about child support that you should know! The things they don't tell you about child support that you should know! I decided to write this in blog form because I feel it will be easier to comprehend in writing. So here is the back story: when I initially filed for divorce from my first husband, child support was calculated based on our incomes at the time. I wanna say that I was getting like $181/mo for two kids. Fast forward a couple years and my ex filed to have the support lowered based on an income of him not having a job. In Iowa, the state minimum for two children is $48/month. I *think* it's $35/month for one child. For the past three years, I have been frustrated, thinking that it was yet another reason why our government was broken. How is it fair that I work two jobs and pay for everything while he skates by with only being obligated to pay $48/month?? If you are a parent who has their kids full-time, you know they aren't cheap. Child support is supposed to cover the necessities such as food, clothing, shelter, utilities. Plus think about the extras: birthday party gifts, field trips, sports fees, club fees, school fundraisers, medicine, toiletries... the list goes on and on. And God forbid you complain about it on social media- I've heard every response in the book (mostly from men) about why I'm a horrible person for expecting a dad to help support his children financially. But that's not what this post is about. It isn't about who is right and who is wrong because I think that the majority of decent human beings know. And this also isn't a post to bash on my ex. I am writing this for women who thought they were getting screwed over because the biological dad didn't work (or worked under the table) and they had no choice but to accept getting nothing in child support. 9.11(1) Substantial injustice would result to the payor, payee, or child(ren). 9.11(2) Adjustments are necessary to provide for the needs of the child(ren) or to do justice between the parties, payor, or payee under the special circumstances of the case. 9.11(3) Circumstances contemplated in Iowa Code section 234.39. 9.11(4) The court may impute income in appropriate cases subject to the requirements of rule 9.5. If the court finds that a parent is voluntarily unemployed or underemployed without just cause, child support may be calculated based on a determination of earning capacity. A determination of earning capacity may be made by determining employment potential and probable earnings level based on work history, occupational qualifications, prevailing job opportunities, earning levels in the community, and other relevant factors. The court shall not use earning capacity rather than actual earnings or otherwise impute income unless a written determination is made that, if actual earnings were used, substantial injustice would occur or adjustments would be necessary to provide for the needs of the child(ren) or to do justice between the parties. Now that I had this information, what do I do with it? I went to the Child Support Recovery Unit website (in your state it would be whomever is responsible for collection and distributing payments.) I filed for a review since it had been more than the required two years. Of course their review came back as no change because he still had no income. I felt a bit disheartened, but when you receive your report, it says that you can request in writing a court hearing for review if you disagree with the findings. You have to send back a letter stating that you want a review and why. I wrote that my reasoning for why was based on the above court rules for variance from guidelines. I was still a bit worried that it was a pointless venture, but I commented on a local FB mom support group asking if anyone had gone to court over child support and what the outcome was. I got soooo many responses from moms in the same position I was in, but only one response from someone who had actually gone. Her ex had taken HER to court for a reduction because she was voluntarily unemployed so she could be a SAHM. The court imputed earnings on her based on her prior work experience and education. This was not good news for her, but good news for me if that was going to be how it went for me. Fast forward to the court hearing. I had all my necessary documents, pages of notes, print-outs, everything I thought I would need to plead my case. I didn't use any of it. We sat down with a public attorney for the state who had all our information on record. She presented what she thought would be fair based on his "earning potential" at the time, based on an income of $24,500 a year with me making more on my end. 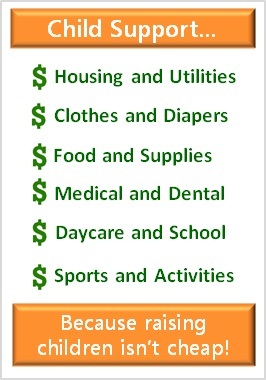 The total amount of monthly support for two children based on that income was $522! However, her job is to try and get it so that you don't have to go in front of a judge. In order for that to happen, the two parties must agree to an amount. Of course my ex was opposed to that amount and he tried to argue HIS side about why he shouldn't have to pay that much. The lawyer made it clear that the judge would impute earnings on him whether he had a job or not and that it was likely the judge would impute a similar amount. So after a couple hours of listening to him argue, we settled on a lesser amount. I won't give the amount, but it was a lot more than $48/month and even more than the original $181/month in our divorce decree. Justice was served... for me anyway. Now it is your turn to try and get what you and your children deserve. If you find yourself in the same position I was in, do not just accept it. Iowa is definitely not leading the way for anything when it comes to fair laws, so unless you live in an even shittier state, I'm sure the law is on your side. It just takes a bit of digging and some paperwork. If you have any questions or need help, please contact me! aborderlinemom@gmail.com You deserve what is fair.